When you combine Aamir Khan with a director like Nitesh Tiwari, you can always hope for something brilliant. Aamir is known in the industry for giving the best, most refined and most perfect results. He cherishes, studies and almost turns himself into the character of the movie, no wonder we have labeled him, Mr. Perfectionist. The first poster of Aamir Khan’s movie’ Dangal’ has hit the internet. The movie is produced by Siddharth Roy Kapur who has a lot of hope with this dramatic hit duo. The poster of the movie does not reveal a lot of information; all that it really does is make the audience more inquisitive. After looking at the poster, one cannot really guess a lot about the movie which make it more mysterious. 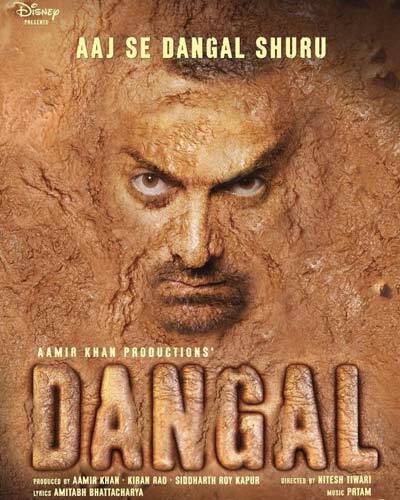 We can only see the face of an angry looking Aamir sweep out from the dry lands of earth around him. The poster is quite dramatic and definitely will attract a lot of attention. Aamir Khan’s Dangal is based on the life of former wrestler and Coach Mahavir Singh Phogat who trained his three daughters and one niece for the Commonwealth Games. His daughters Geeta, Babita, Kumari and niece Vinesh have been successful gold medalists. After much speculation to finalize the lead actress opposite Aamir Khan in Dangal, the makers of the film have finally ended the hunt. After a long war on who will play the role of Aamir Khan’s wife, the makers of the film have finalized Bade Achhe Lagte Hain fame Sakshi Tanwar. Aamir Khan will be seen playing a father to four daughters in Dangal. Recently, Fatima Shaikh, Zaira Wasim, Suhani Bhatnagar and Sanya Malhotra had been finalized to play the roles of Aamir Khan’s daughters. We can’t wait to hear, see and more of ‘Dangal’, the poster certainly has worked its magic on us. The movie is set to release in early 2016.